Add seeds, nuts, flakes, spices, and salt to processor. Pulse to combine and thickly chop. In a small bowl, whisk melted coconut oil, honey, and vanilla. Add wet ingredients to processor, pulse to mix thoroughly. Spread mixture evenly onto baking sheet. Bake 25-30 minutes (until golden brown). Stir every ten minutes to prevent burning. Add dates to processor and pulse until chopped. 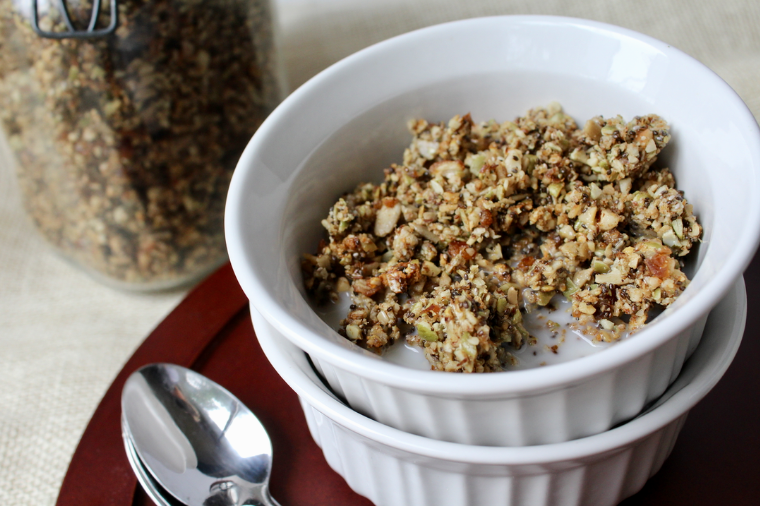 Allow granola to cool, then mix in chopped dates. Recipe adapted from Detoxinista Pumpkin Seed Granola.